It had been over a decade since I had had a dog. I was in elementary school when my family’s pug, a sweet little boy named Bundle, had passed away. Now, I was engaged to be married and my boy came with his dog, a six-month-old beagle named Sadie. I wasn’t surprised when she barked at strangers. I wasn’t surprised when she pulled on her leash each time we walked. I wasn’t surprised when she destroyed squeaky toys with a vengeance unrivaled by Cujo. I was surprised, though, when I came home from work one day to find paper products and other garbage strewn all across the house, some half-eaten, some merely investigated. While I had been busy at work, Sadie had been busy, too–exploring the bathroom trashcan and relocating its contents throughout the house. More recently, my husband and I were at a family get-together when my husband walked in on a family member’s small corgi mix eating chicken bones out of the kitchen trash can, which he had somehow managed to tip over. Normally docile and snuggly, the stout-legged dog turned into a snarling beast when my husband attempted to take the chicken bones away. Although some dogs are more interested in the garbage than others, nearly all dogs get curious about the trash can at some point, and it’s a dog owners responsibility as their caretakers to protect them from the dangers that may result. Whether it be chicken bones or legos, you can do this by getting a dog proof garbage can. Our top pick for a dog proof trash can is the Simple Human Trash Canister with Dog Lock, described in more detail below, but several other effective options also exist, including dog-proofing your current trash can. Based on your dog’s particular behaviors, traits, and lifestyle, one or more of these dog proof trash can options may prove better suited for the two of you. Read on to find out why you should dog-proof your trash can, what circumstances merit dog-proofing your trash can, which dog proof garbage can might work best for you, and how to dog-proof your current trash cans. Why should I dog-proof my trash cans? How do I know if I need to dog-proof my trash cans? What dogproof trash cans are on the market? How do I know which dog-proof trash can is right for us? How can I dog-proof my current trash cans? Besides the fact that a dog tempted by the trash can leave a massive mess behind when they rip open garbage bags, the contents of your trash can may pose serious threats to your dog’s health and safety. After all, we throw garbage away for a reason–and it’s not because we want to feed it to Fido. Many human foods are toxic to dogs, so food waste in your trash can could prove harmful or, worse, fatal to your dog if ingested. Foods like grapes, raisins, onions, garlic, and chocolate, among others, can be toxic to dogs. Bones can splinter in your dog’s intestinal tract or become lodged in his throat. Even food that might usually be safe for your dog to consume may be rotten if it has been in the garbage long enough, and could sicken your dog if he eats it. Often, we throw broken or old objects into the garbage–things like dead batteries, broken glass, worn-out socks, deflated balloons or balls. Items that may seem harmless could pose a serious threat if they become lodged in your dog’s throat or get stuck in his intestines. While the food or item itself may be dangerous, a secondary danger exists to your dog, as well: developing food aggression. If you catch your dog rifling through the garbage bags, you will naturally be tempted to remove anything he may have in his mouth. This reaction, though, especially if experienced on a somewhat regular basis, can cause some dogs to learn that they need to compete for their food, thus leading to food aggression, which can ultimately result in your dog’s potentially biting someone he believes is trying to take away his food. Finally, even if your dog doesn’t ingest anything he finds in trash bags, the trash can itself could injure him if he tries to knock it over or open it. A heavy trash can could crush or injure your dog if it topples over on top of him. Similarly, a dog could get his head stuck inside a trash can and find himself unable to break free. These are just a few of the reason you may want to invest in a dog proof trash can, or carefully dog-proof your current can. We’ve established why it’s so important to prevent a dog from getting into the garbage, but how do you know if you really need to worry about your dog getting into the trash? Is it really necessary for you to go to the trouble of buying a new dog proof trash can, or dog-proofing the cans you already own? Here are some things to consider. If your dog is not crated or contained and has access to various rooms (and the trash bags within them), when he is unsupervised in the house, you should dog-proof your trash cans. Even if your dog has never shown any interest in the trash can in a single room before, it only takes one enticing or pungent item in one trash can to pique his interest. If your dog suffers from anxiety, dog-proofing your trash can may help prevent him from seeking out items to chew or destroy from within it. Similarly, if your dog is destructive or likes to chew, dog-proofing your trash can will help eliminate his potential to satisfy his destructive tendencies by spreading garbage throughout the house and will decrease the chances that he satisfies his chew drive by shredding trash bags that were too easily accessible. In addition, if your dog is high energy and prone to bouts of boredom while you are busy or away, you should consider dog-proofing your trash can to decrease the chances that its contents become a temporary relief for Bingo’s boredom. Food smells provide one of the main motivations for dogs to investigate the trash can. If your dog is food motivated, you definitely want to consider dog-proofing your trash can to prevent him from sniffing around for snacks that may smell delicious but may actually harm him. Even if your dog has never shown any interest in the trash cans or their contents, if he is tall enough to get his head inside the can or large enough to tip it over, spilling the garbage within, you should consider dog-proofing your trash can or purchasing a dog proof trash can. There are many options for dog proof garbage cans available, both online and in brick and mortar stores. It’s important to keep in mind, though, that no single trash can is guaranteed to prevent your dog from getting into the garbage. Many can, however, significantly decrease the chances that your dog will dumpster dive, and in some cases, entirely prevent your dog from dumpster diving. Depending on your dog, these five options might prove effective. 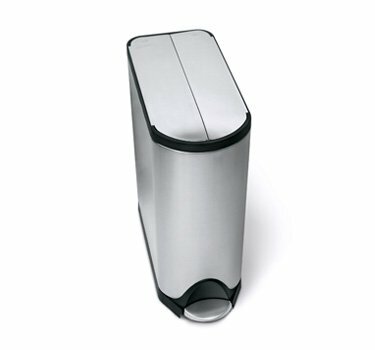 This dog proof trash can is available on Amazon and SimpleHuman.com, as well as at Target. It earned mixed reviews regarding its resistance to dogs. One reviewer said her dog managed to find his way into this trash can within a minute. Two others, however, said their doggy garbage problem was solved–one dog who tried couldn’t even spill it when he knocked it over, due to the lock feature. Essentially, these plastic trash cans are likely to work for you, but the effectiveness will really depend on how motivated and/or large your dog is–as well as your ability to remember to lock the lid. 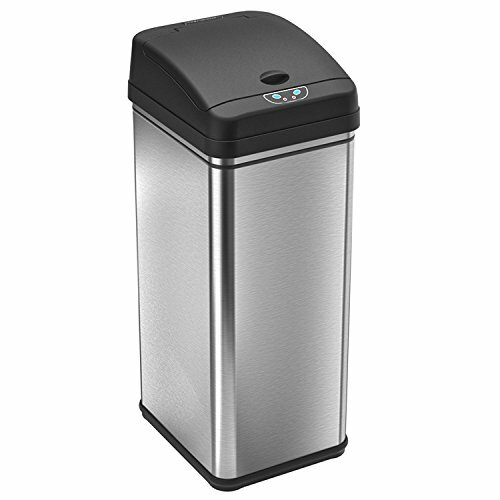 This touchless trashcan is stainless steel and available on Amazon, as well as from other retailers. It uses a motion sensor to open its lid, and also boasts a deodorizer feature that could not only minimize the smell of garbage in your kitchen but may also succeed in decreasing your dog’s level of interest in unveiling what the trash can contains, especially for a food-motivated dog that likes to tear apart trash bags. 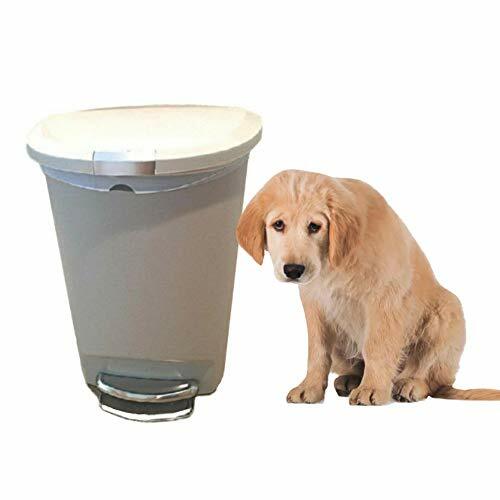 Also available on Amazon, this 24-gallon dog proof trash can is designed to be too heavy for most dogs to tip over, though one customer review cautions that if the can does tip over, its weight makes it very dangerous, as it could crush or injure your dog. The lid does not lock, but one reviewer said her two labs of 80 and 100 pounds cannot knock it over to spill its contents. This trashcan bears up to big dogs. Plus, its foot pedal allows you to dispose of trash hands-free, without having to touch the lid. 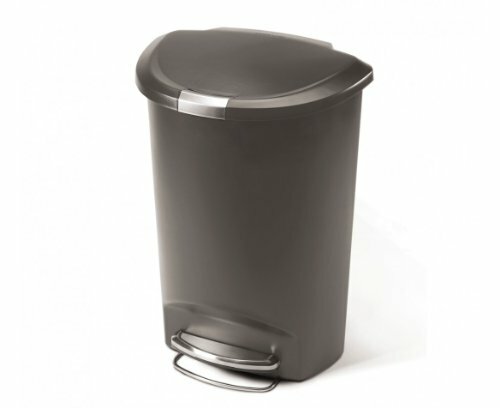 This stainless steel dog proof garbage can earned solid reviews. Only one reviewer claims it was not dog proof. Several others write about its lid’s clamshell design successfully foiling even their large dogs’ attempts to get inside. One reviewer even comments on the fact that the edges of the trash bag liner don’t show, so her dogs cannot tug on the bags to tip the can over. Plus, its stainless steel makes it a fashionable addition to any kitchen. If your dog can access your outdoor garbage can, you might consider this dog proof trash can, for sale on Amazon. It’s made in the USA especially to prevent animals from getting into your trash. Most reviewers seemed to have purchased it to prevent squirrels, raccoons, and other critters from accessing their trash, and while it is not rated highly for success in that area (most reviewers said small rodents chewed through the plastic can rather quickly, and a bear would have no trouble), it would likely succeed at keeping your dog out of the garbage can–unless he’s particularly adept at chewing through plastic (some dogs are–you know your dog best). If that’s the case for your dog, a metal trash can may be a more effective option. Lightweight plastic trash cans can be fairly easy for a dog, especially a large one, to tip over and spill. If you have a large dog, or even a small dog adept at trash tipping, pick a metal can over a plastic one to help decrease your dog’s chances of knocking it over. The heaviest can listed above is the Rubbermaid Commercial Defenders Step-On Trash Can. Choosing a can with a rubber bottom can also help prevent tip-overs, as the rubberized bottom will grip the floor, helping to anchor the can in place. A can with a lid will obviously help deter a curious canine from getting into the garbage can and tearing up the garbage bags. If your dog has shown little interest in the trash, a lid may be the only feature you need to keep him out of it. The two most common lids are step-to-open or press-to-open, but some cans, such as the stainless steel iTouchless Deodorizer Automatic Touchless Stainless Canister discussed above, feature motion-activated lids. In general, the heavier the lid, the better. The heavier the lid is, the harder it will be to nudge open. 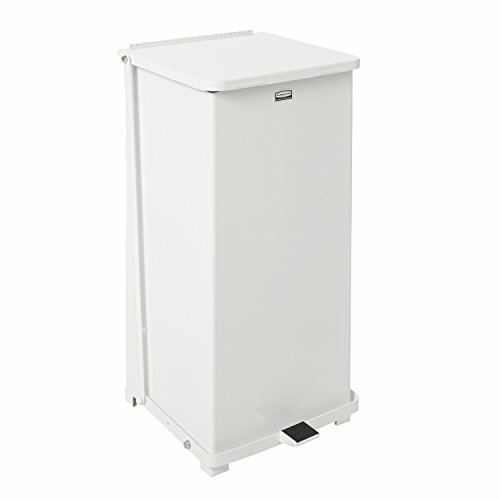 That said, while the butterfly lid of the Simple Human Butterfly Step Trash Can is not necessarily heavy, its shape and design make nudging it open difficult. If a mere lid proves insufficient in keeping your furry friend out of the garbage can, try a lockable lid, which adds one more obstacle. The Simple Human Trash Canister with Dog Lock and the Rubbermaid Animal Stopper Trash Can both feature lid locks. Don’t imagine your a bad pet parent just because you’re reluctant to invest in new trash cans throughout the house. There are several ways you can dog-proof your current trash cans with materials you may already have lying around the house. The best way to keep your dog away from the trash is really to keep the trash bags away from your dog. To do so can require both appropriate containers and smart locations. Some dog owners succeed simply by stashing their trashcan in a kitchen cabinet their dogs cannot open. Others aren’t so lucky. After all, dogs can smell the trash even if they cannot see it, and some will stop at nothing. If your dog seems to be on a crusade for the garbage, instead of using a garbage can inside your house, use an outside dumpster or a garbage can that is beyond the confines of your dog’s yard. If your dog is particularly tenacious, you might consider fencing your trash can in or keeping it outside the fence altogether. If your dog still manages to access the trash, consider equipping your fence with coyote rollers, contraptions that mount on top of your fence and make jumping or climbing it difficult. Again, keeping the trash bags away from your dog is the best way to keep him out of it, so when your dog is unsupervised, put all trash cans–especially ones without lids–in one room and close door to deny your dog access. Another way to deny your dog access to the trash can is to keep it in a closed cabinet, closet, or pull-out cabinet, and equip the door(s) with child-proof cabinet locks. Alternatively, if your dog is small, simply elevating the trash can out of his reach might suffice. Try placing it on top of a chair, a counter top, or a stool. If your trash can features a lid, but your dog still manages to access its contents, try using bungee cords to strap the lid down. If bungee cords prove too easy for your dog to get around, you can craft your own lock on a step-open can with a lid. Another option is to place a weight on the lid. If you decide to try this, be careful that whatever you use to weight the lid is not fragile or breakable, and cannot injure your dog in the event that he tips the can over, knocking the weight off. For outdoor cans, try Trash Buddy, available on Amazon. This product is designed to secure the lid on outdoor trash cans without hindering pickup by your disposal company. If you know your dog is capable of tipping the can over even if the lid is weighted, an added precaution might be to weight the bottom of your can. Before placing a bag in the can, place several bricks, heavy rocks, cinder blocks, etc. in the bottom of the can to make tipping it over more difficult. If your big dog succeeds in knocking over and spilling any trash can you’ve tried, try securing it to the wall. A different route to preventing Rufus from eating trash from the can involves obedience training. One method includes using a dog-repellent spray on your dog whenever he gets close to can. Eventually, he will learn to associate the trash can with the unpleasant spray, and will avoid approaching the can, much less rummaging through it. Place a motion-activated spray canister near your trash can. This product can scare dogs away if they get too close to the trash can. Consider your dog’s temperament before going this route, as it may prove traumatic for some anxious, shy, or jumpy dogs.